That’s because good recruiters are experts in their fields, Arias says. “They know the sector and the people and the trends, and that allows them to be effective at finding the right talent,” he adds. What catapulted Arias into a successful executive recruiting career, he says, was his skill at developing and maintaining personal relationships. Today, he places executives in positions at mid- to large-size global entities, with a focus on boards of director searches for Korn/Ferry, a global giant in executive talent solutions, with 3,000 employees in 80 offices. It’s an area Arias knows well, given his own extensive involvement with boards. In fact, his 1996 appointment to the Stanford University board of trustees, a who’s who of 34 nationally recognized business leaders, was the inflection point that drove him into recruiting. “I thought, this is an incredibly humbling opportunity to serve with lots of people that I really admire,” he says. That appointment would also connect him with another board member, a partner at a private-equity firm seeking independent directors for a portfolio company, AFC Enterprises, the parent company for Popeye’s Chicken. Arias’s experience there solidified his knowledge of the boardroom. “I’ve sat in those boardroom seats, so I know exactly what clients are looking for, and I know what to convey to potential candidates in terms of the rigor of being a board member and the speed bumps to watch for along the way,” he says. Much of Arias’s work today is dedicated to seeking diversity in the business world. Although Arias’s parents were born in the United States, he grew up in a traditional Mexican neighborhood of El Paso, Texas, and his first languages were both Spanish and English. “I have strong ties to my culture, and feel strongly that Latinos are very relevant to the continued success of this country, and if the rest of the country doesn’t see it that way, we’re doomed as nation,” Arias says, who was recently named global leader of diversity and inclusion for Korn/Ferry. To increase the number of Latinos in the business world, Arias is starting in a place he knows well: the top. 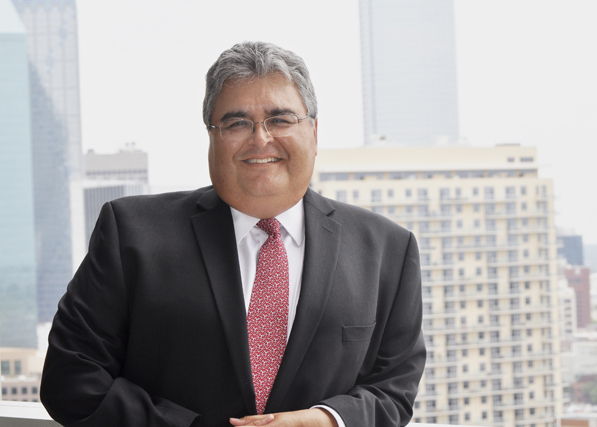 “In the professional world, I see a lot of opportunities for companies to become better at attracting the Hispanic consumer, and the only way they can do that is by starting at the top and putting in Latino directors. We have to start with the corporate boardroom,” he says.